You Are Here: Home » EU, Kurdistan, Turkey, USA » Understanding Turkish Expansionism: Impose a No Fly Zone! Even though the charter of NATO proposes “defending” the territorial integrity of member countries, Turkey has accelerated its practice of violent and aggressive expansionism whilst member of NATO. Turkey has been occupying Cyprus, parts of Syria and Iraq and has continued to violate the air space of its neighbors. Turkey is killing Kurdish civilians on an almost daily basis, not only in Turkey, but also inside Syria and Iraq. Until now the US and EU have not shown any serious concern about this. Thus the Turks have built up a policy and a strategy on the assumption that this US/ EU silence is practically the same as being given consent. Erdogan is urging that he want to establish a “buffer” zone to “protect” Turkey. That buffer zone Erdogan is planning for will be inside Syria, not inside Turkish territories. 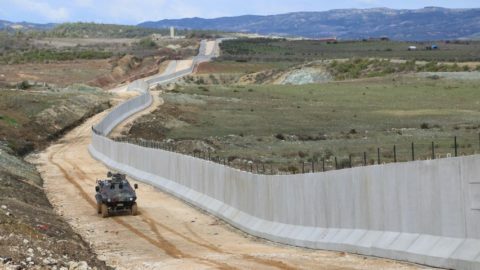 According to Ergun Turan, the Prime Ministry’s Directorate of Social Housing manager, “the 144-kilometer (90-mile) long wall was built on Iranian side to keep rebels of Kurdistan Workers’ Party (PKK) fighters active in the region at bay” and it will continue to cover the total length of the border line. In addition, in January Erdogan announced plans to build a wall along Turkey’s borders with Iraq and Iran, (i.e. Kurdistan) similar to the one being currently erected along the 911-kilometer (566-mile) frontier with Syria. Turkey’s aim is to separate Kurdish people from each other. It’s a serious human rights violation that the US, EU and NATO are letting Turkey to practice such racism and military aggression against Kurdish people. Without the logistic, political and diplomatic support of NATO / EU / US, it will be very difficult for Turkey to practice such atrocities against Kurdish people. The Turks have established at least 20 large military outposts in the northern part of the KRG area, saying that if “the US has a presence in Iraq, why not we have a presence too?” Turkey and Iran are not only interfering in the KRG’s and Iraq’s affairs, but in many cases controlling the political and economic sphere and decisions. This explains the instability which the KRG and Iraq are suffering. So, despite Erdogan’s daily aggression, building up walls, separating Kurdish people from each other and the systematic oppression, he claims on Friday 25th January in Erzurum that Turkey needs to establish a “buffer zone” to protect “itself”, emphasising that Turkey could do this “within the next few months”. Just three days after, on 28th January, Erdogan, speaking to Red Crescent and Red Cross representatives in Istanbul, stated: “We are aiming in the first phase to create safe zones where four million Syrians who now live in our country can return”. The world has witnessed how Erdogan has taken thousands of extreme Sunni Arab families, placing them in occupied Kurdish houses in the Kurdish city Afrin. After just one year of Turkish invasion, Erdogan’s plans to change the city’s demography have taken shape. After the U.S. President Donald Trump’s tweet about a “20-mile safe zone”, Erdogan replies that “Turkey to construct new housing communities in the zone if the coalition forces give material support”. Erdogan is serious when he says that the coalition would give him “material support”. Erdogan’s arrogance, defiance and audacity have grown dangerously. It’s obvious that Turkey’s concern about its “security” is fabricated and inheres to a “Goebbel-like propaganda” which serves the expansionist doctrine Erdogan pursues in the spirit of the Ottoman dream. The responsibility now lies with the West’s democracies to stop Erdogan’s fascistic rule and his expansionistic progress, and especially his atrocities against Kurdish people. People from around the world, of all ideologies, who are against fascism, totalitarianism, theocracy and racism, must do their part, to participate as much as they can, to stop Erdogan and his fascistic colonialist machinery. Consequently, a buffer zone must be established to stop Turkish aggression against the indigenous peoples in the region, especially those who have paid and are still paying the high price of freedom in combating ISIS and other Islamic terrorist proxies.